Place cheese in 1 side of resealable sandwich-size plastic bag; loosely tie pie cleaner or twist tie around middle of bag. 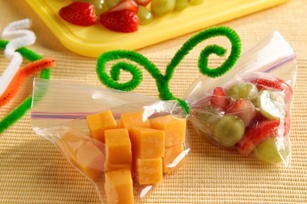 Place fruit in other end of bag; seal bag, then twist pipe cleaner tightly to separate cheese from fruit. Curl ends of pipe cleaner to resemble antennae of a butterfly. Refrigerate until ready to serve. Untwist pipe cleaner, leaving bag sealed. Gently shake bag to mix fruit and cheese. Open bag and enjoy! This eye-catching snack is easy to make and a fun way to get your kids to eat a 1/2 cup of fruit. Prepare using seedless red grapes. Add fresh blueberries when they are in season.